A very common dessert here in Buenos Aires is queso y dulce, which just means "cheese and sweet". The dulce in question is a very thick jam, so thick that it's sliceable, made of either membrillo or batata (sweet potato). You might be more familiar with the English name for dulce de membrillo: quince paste. It's commonly served in Spain with manchego cheese, and it is delicious. And until now, I had no idea it was made from fruit! Fruit that looks a lot like a pear, both inside and out. 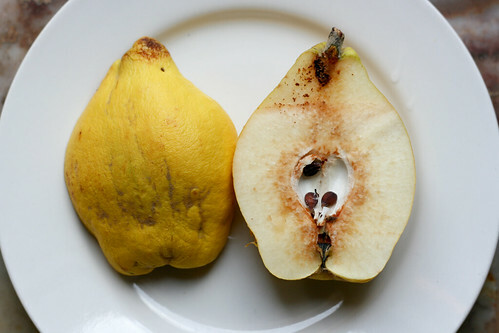 The membrillo, or quince, is very hard, and was much harder to cut than a pear. At one point I thought it had a big pit because it was so difficult to get my knife through the center. It does taste vaguely like a pear, with almost the exact texture of a potato. Ken had a strong (negative) reaction to its texture and starchiness. I was less offended, and even kind of liked it. I don't think quince is generally eaten raw, so I'm going to try my hand at making quince paste with the remainder of our FotD. New! All Fruit of the Day and other food-related posts can be found on ultrafinefood.com.